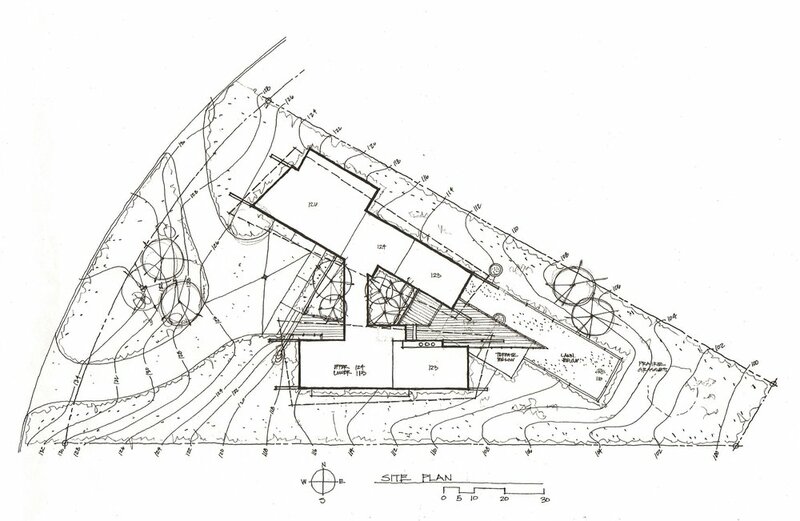 The owners of this home purchased a sloping pie shaped lot with access from above. There are nice views of downtown Great Falls and the Missouri river to the East. Capturing these views was a priority. Also, this open hillside lot is exposed to the prairie wind which can make decks and outdoor spaces uninviting. Creating some protected outdoor space for the family became an added goal for the design. The lot is wide enough to exploration layout options. One option is to build a simple square in the center of the lot. Another is to build a longer L shape. Most of the homes in the area follow these models. But they do not help create compelling or well protected outdoor spaces. 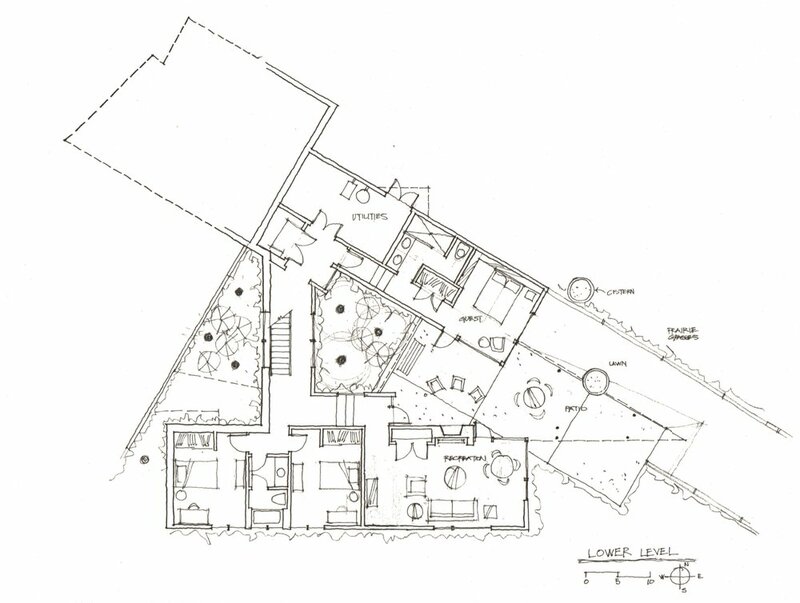 The option chosen and shown below was to split the house into a bedroom wing and living wing creating a central protected outdoor space between them. An outdoor deck, lower level terrace and a grove of Aspen trees now occupy this protected spot. The Aspen grove softens the deck areas and mimics the sheltered canyons in eastern Montana. The southern portion of the home includes a TV area, kitchen dining and living. The northern portion the garage laundry and master suite. A narrow circulation hall with stair connect the two wings. The central deck is accessed from the Master bedroom, Living room, and hallway. The main level deck is a central shaded and wind protected outdoor spot for the home. The Aspen trees help provide some greenery and a bit of shade. The deck comes to a sharp point making fun place to stand and view the river. A lower retaining wall helps creates a manicured lawn area for play. The lower level opens out to a terrace. Aspen trees are planted in the beds either side of the house staircase. A adjacent small manicured lawn extends out toward the view. Rainwater is collected by two large cisterns. A section between the two building forms shows the connecting hallways and planting areas. The deck and terrace are to the right. Low slope metal clad roofs sit atop long glulam beams. Large gutters at the low end catch water and drop it into cisterns below. Large windows face the view downslope. Large beams and dramatic roofs give the home some design power. Colors of the home are intended to blend with the dry prairie grasslands while the forms provide a powerful presence. Projecting roofs, deck and beams are dramatic. The sharp point of the deck is always a topic of conversation. The home works well with the site, provides wonderful views to the river, and fits nicely with the local environment. At the same time it has a strong presence. The central outdoor space becomes the heart of the home during the spring summer and fall with barbecue, chairs, table and benches. The coppery color of the exterior blends well with the dry summer grasses. 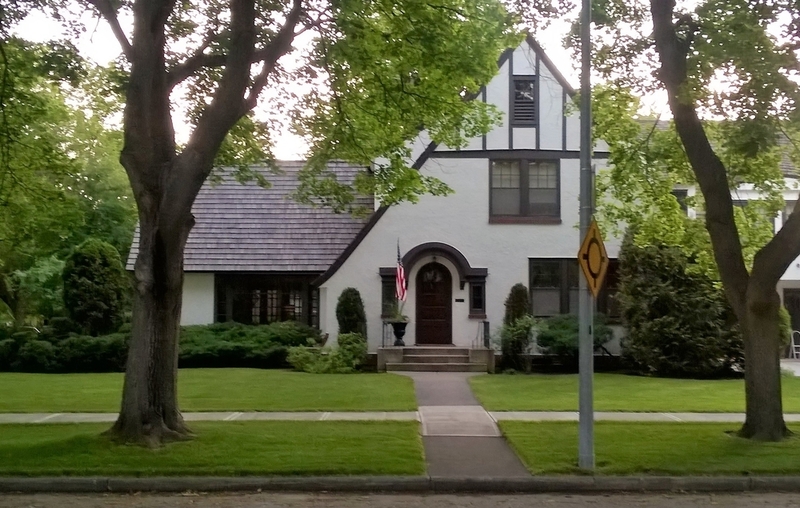 My wife and I ran across some beautifully proportioned homes in Missoula, Montana recently. They were such a pleasure to see and made our walk more rewarding. The architects and builders of these homes spent extra effort making sure everything looked just right. Proportioning the walls to the windows to the doors to the roof is a process of refinement. And these were well refined! The current owners have kept them looking beautiful. Their landscaping sets them off beautifully. It is a delight to see some of these wonderful places when out for a walk. Here is hoping for great architecture everywhere!